As a Coeliac, you always get excited when you hear about a new place to eat out. Especially when it’s a pizzeria! We don’t have many options in Dubai where we can indulge in gluten-free meals so any addition is more than welcomed! Gluten Free U.A.E. asked if Yasmeen and I (we are are both Coeliacs) could go on its behalf to the opening of Russo’s New York pizzeria, as they would include gluten-free pizza in their menu. The idea was to see how they prepare their pizza, whether it safe or not for people with gluten sensitivity/intolerance/Coeliacs. We went on a Thursday night. After a hard day at the office, I was already starving and I was keeping my fingers crossed that their pizza would be safe, else, I’d have to endure my hunger till I reached home. Russo’s welcomed us with wide open arms. They immediately informed their staff that we are “the gluten-free table”. They invited us into their kitchen, they were very eager to show us around. Their gluten-free base is made from scratch in their US branch and then frozen and shipped to the UAE. Since they don’t have a separate kitchen here, they do not want to take the risk of making the pan in the same kitchen as the non GF pizza. They keep the GF base in a separate cupboard, away from non GF ones. The person handling the GF pizza will not touch the other pizza. The toppings are also separately kept. All utensils for GF pizza are purely used for GF pizza. In fact, the GF pizza is handled in the back, the other one is in the front. The shovel used to put the pan in the oven is separate. Each GF pizza is on a grill, only used for GF base. In the oven, although cooked together, the GF and non GF will not touch each other, they are always at a reasonable distance. We did make a couple of suggestions, like to check if their soap is GF or to dedicate a shelf for GF pizza in the oven. They were receptive and promised they would consider them. However, all in all, I found Russo’s New York pizzeria to be very tuned into cross-contamination and very knowledgable. They are Coeliac Org. certified in the US. I am not a sensitive Coeliac, I cannot tell when I eat gluten, however, I eat in only a couple of places and I decide to eat in a new place only once I’ve had the confidence that the staff is knowledgeable or reliable. At Russo’s I felt at home. Yasmeen is a sensitive Coeliac. She did not have any reaction after having their pizza. Yes, Russo’s does not have a separate kitchen and you can never be 100% certain contamination doesn’t occur, still, I had the assurance that they are professionals and putting all their efforts into avoiding it. It’s also worth mentioning that they are focused into providing natural ingredient pizza, free of any preservatives. They will soon include in their menu Gluten-Free pasta, as well. If you feel like having a bite and see for yourself, go visit them in Jumeirah Centre on Jumeirah Beach Road. They are opening a branch in Sharjah soon, one in Abu Dhabi, the next around Marina/Motor City area. Big thumbs up for Russo’s New York Pizzeria! They made two Coeliac girls very happy! Now Open in Jumeirah Centre and soon at Al Wahda Mall- Abu Dhabi and Sahara Centre- Sharjah. So happy you had an awesome time at our Russo’s! It is our pleasure serving you and we hope to see you again and again! 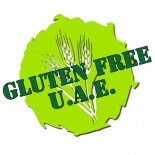 Thank you for including us onto your awesome Gluten Free UAE blog. Note that we are already open in Sahara Centre Sharjah, Al Wahda Mall Abu Dhabi as well as Dalma Mall Abu Dhabi, along with out Jumeirah branch which you visited. More openings on the way so stay tuned and follow us on Facebook Russo’s UAE. Thank you and please don’t hesitate to contact us should you need any assistance. This entry was posted on 14/04/2013 by glutenfreeuae in Reviews and tagged dubai, glutenfree, pizza, review.